How to keep a family of four entertained for a morning or afternoon for under $20, total? When you&apos;re in Monterey County, it&apos;s easy. Follow the list below for frugal and free family activities - then splurge on dinner! Spot sea lions, sea otters and other examples of marine life at the mouth of Elkhorn Slough. Sea lions have taken over what was intended as a public dock at the mouth of Elkhorn Slough; hundreds of them congregate daily. Pelicans, seals and sea otters all gather nearby; it&apos;s one of the best places to spot marine life in Monterey County. The sea lion dock and parking area are west of Highway One about 1000 feet south of the turn-off for Moss Landing State Beach and 500 feet north of where Highway One crosses over Elkhorn Slough. Go tidepooling at Point Pinos in Pacific Grove. Known as one of the richest tidepooling habitats in the world, Point Pinos has some exposed tidepools even when the tide is not at its lowest. You&apos;ll see starfish, sand dollars, sea anemones, hermit crabs and more. Please don&apos;t disturb these creatures; Monterey Bay is a protected habitat, and the sea creatures will be much happier in the bay than on your desk. For a guide to tidepooling and what you might see, download California State Parks&apos; free A Guide to the Side of the Sea. Pinnacles National Park is a great place to spot birds, bats and butterflies. It&apos;s one of the nesting places of the rare California condor, and provides a home to deer, foxes, jackrabbits, bobcats and 14 species of bats. Take a free tour with a park ranger (see the schedule), who will be able to point out even more creatures you might not spot. Walk on the wild side and spot exotic animals such as lions, elephants and kangaroos at the Monterey Zoo. Tours are available daily and passes are just $12 for adults and $10 for children. Monterey County has three historic California missions. Each qualifies as a must-see, especially for any Californian child in fourth grade or about to enter it. The lovingly restored Carmel Mission is an easy jaunt for anyone staying on the Monterey Peninsula or in Carmel Valley. The Soledad Mission is right off Highway 101 in the Salinas Valley and truly gives the sense of how remote these missions must have felt. The San Antonio Mission in Jolon is remote and requires driving into Fort Hunter Liggett; it&apos;s also the mission that is the most like it was during Fr. Junipero Serra&apos;s life, and well worth the trip. Learn more about those animals you&apos;ve just spotted at the Pacific Grove Museum of Natural History. This inexpensive museum ($5.95 for children and $8.95 for adults) features exhibits on native plants, animals and geography, as well as a real whale skeleton and a life-sized whale sculpture out front. "Science Saturday" on the last Saturday of the month offers children&apos;s science activities structured around a specific theme. Also in Pacific Grove, visit the Point Pinos Lighthouse, once the only building for several miles. It&apos;s the oldest continually operating lighthouse on the West Coast. The Agricultural and Rural Life Museum in San Lorenzo Park in King City offers a trip back in time to Monterey County as it was over 100 years ago. The museum features a historic train depot, a one-room schoolhouse, a blacksmith shop, a barn with exhibits showing how agriculture evolved in Monterey County, a historic house preserved as it was 100 years ago, and outdoor exhibits of historic farming equipment. Colton Hall isn&apos;t just part of Monterey&apos;s City Hall; it&apos;s also a museum dedicated to the history of Monterey. The building holds original documents from the California Constitutional Convention held there in 1849. At the back of the building, explore the Old Monterey Jail, used as the city jail from 1854 to 1956. No one ever escaped, and as you look at it, you&apos;ll see why. Burn off excess energy at Lake El Estero Park&apos;s Dennis the Menace Playground in Monterey. This free playground has all kinds of exciting and unusual equipment, from tunnels to climbing walls designed for kids under 10. If your child prefers skating, visit the Monterey Skate Park next door. Both are free. Visit Point Lobos State Natural Reserve in Carmel. 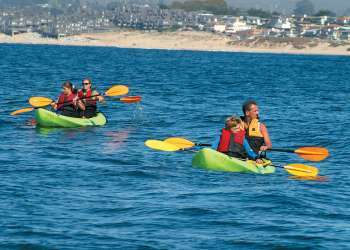 See sea lions and cormorants, spy whales migrating through Monterey Bay, visit a building that was once a whaler&apos;s cabin, and enjoy a picnic lunch by the side of the water. Take one of Monterey County&apos;s Six Top Scenic Drives (see link for directions and maps), and explore the breathtaking views and natural beauty the area is famous for. Go fly a kite at Monterey State Beach in Seaside. The Seaside section of the beach is known for its steady winds coming off the water, perfect for kite-flying. You&apos;ll see kites that are over 20 feet long; in the distance, don&apos;t be surprised if you spot parasailers taking advantage of the same breezes. Take any of our Top 10 Day Hikes. 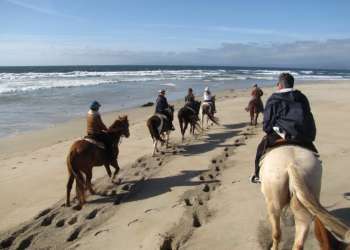 Monterey County is a great hiking destination, and has hikes appropriate for all ages. Have a picnic at Carmel Beach. This dog-friendly beach is a great place to watch the surf, see the sun set, and spot the stars.